I have an intense love affair with couscous. And this is very yummy. If you aren't full at the end of the meal, drink a little water and you will be! In a large skillet, heat oil, add chicken, onion and garlic. Cook 3-4 minutes, stirring frequently, or until chicken is no longer pink inside. Stir in spinach, water, mushrooms, wine and bring to a boil. Stir in couscous; cover and remove from heat. Let stand 5 minutes; fluff couscous lightly with a fork. Sprinkle with cheese. Now, I'm not usually a couscous fan but this looks good ! 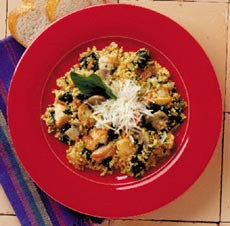 I'm going to "give couscous a chance" and make this one !! !